This is the first book by this author that I have actually read. Going by how much I enjoyed it, I can safely say that it certainly won’t be the last book of hers that I read. I read the synopsis and I was immediately intrigued. I just knew that I had to read this book and I am so glad I did but more about that in a bit. Tessa Markham is a bit of a funny old fish in that I wasn’t sure how to take her. I really felt for her when it emerges that her children have sadly died. I’m aware that grief can drive you to do some silly things. After all you don’t expect to have to bury your children. The death of her children floors Tessa and her world is shattered even more when her husband ups and leaves. I think that he is a typical male and he doesn’t want to talk about his feelings or deal with what has happened. Tessa really has her world turned upside down. When she finds the little lad in her kitchen, I did wonder if she had actually taken him herself but then a few minutes later I wasn’t so sure. Tessa is one strong woman because she has had to be. When the little boy is picked up by the police, Tessa is besieged by the press who smell blood so to speak. Thankfully she has a very understanding boss, who allows her to work hidden away and not have to appear in public. Is her boss all that he seems? Her ex-husband is about as much use as a chocolate teapot and he doesn’t provide much support but then he has his own little secret. Tessa is determined to get to the bottom of the mystery of how the little lad came to be in her kitchen. Tessa doesn’t know who she can trust and who she should steer clear of. She realises that somebody is lying to her but she doesn’t know who or why. ‘The Secret Mother’ follows her determined attempt to get to the truth and expose the person who has lied. I have to say that I literally did not put the book down after I had started it. I usually have the attention span of a gnat but this story got its claws into me from the very first word on the very first page and didn’t release me from its grip until the last word on the last page. I just became addicted to reading it and the Kindle went everywhere with me. I just had to read on to see what happened next and to see if I was getting any closer to the truth. The pages were turning that quickly that it was almost as if they were turning themselves and before I knew it I had finished the book, which I was so disappointed about. I was enjoying the story and the writing style so much that I just didn’t want the story to finish. Reading ‘The Secret Mother’ was a bit like riding on a very long and twisty rollercoaster ride with lots of stomach churning moments. I smugly thought that I had worked out who was telling the truth and who was lying but then the book sent me a curveball, which sent me down another path entirely. In the end I trusted nobody and I believed nobody. This is certainly a book that messed with my head and the story will stay fresh in my mind for a long time to come. In short I absolutely loved this book and it has to be in my top 10 reads of 2017. Shalini Boland is right up there on my list of favourite authors and I can’t wait to read what comes next from her very talented and twisted mind. I would recommend this book to anybody and everybody. 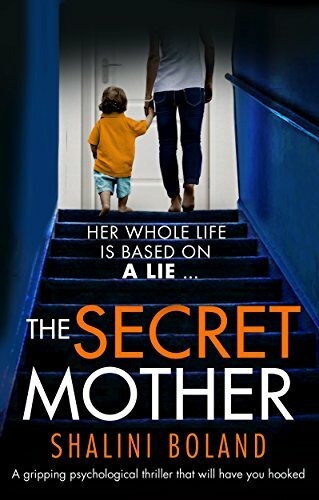 I give ‘The Secret Mother’ 5* out of 5* but I would have awarded it more stars if I could have because I enjoyed it that much.